Sway undecided shoppers with timely promotions. Gift givers are often in the market for things they don’t normally buy, and according to our recent research, price is the main reason they decide to shop somewhere new. We saw this in action last year, as one in four holiday shoppers purchased from a retailer they had never shopped with before. Including promotional text like free shipping, price discounts, coupons, and purchase incentives in your PLA campaign can help close the deal with shoppers still trying to make up their minds. In fact, one in five say free shipping will be the deciding factor on purchases this year, so make sure your shipping settings in Merchant Center accurately reflect free shipping if you offer it. Fill in the gaps in your data feed. Great product data powers the most effective PLAs. It helps you win the trust and confidence of active shoppers by letting them know you have exactly what they’re looking for. One of the most worthwhile things you can do is to take a close look at your data feeds and make sure you’re including all the key information that would draw the attention of a potential customer. Keep your data feeds fresh. The holidays are a time for high inventory turnover and price changes, so don’t disappoint potential customers with stale and inaccurate information. Keep your data feed content up-to-date and upload your feed as frequently as needed (up to 4 times per day) to ensure your products have accurate stock statuses, prices, and promotional information. Remember to account a few hours for data feed processing and approvals. Build a campaign structure you can maintain through the holiday hustle. Create product targets and bid more aggressively on products with good performance and high demand during the holiday season, such as seasonal items, best sellers, or products with high margins. You should also ensure there is only one All products target with the lowest bid of all your product targets to capture consumer interest in your low priority products. Maximize your exposure to constantly-connected consumers. People will shop at all hours, across devices this holiday. For example, 84% of shoppers with smartphones actively browse the web while in a store, looking for comparable deals online. 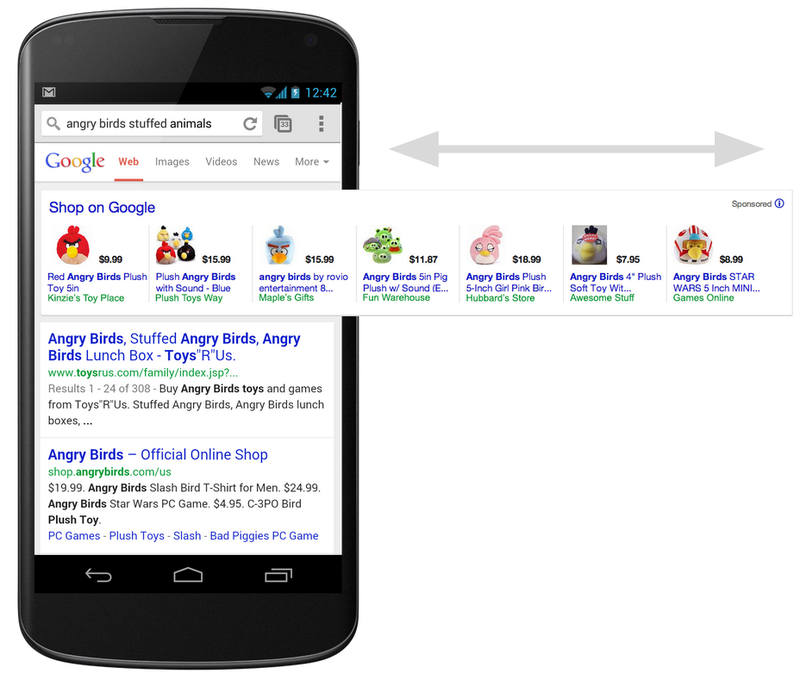 At minimum, aim to maximize your visibility on product search results by running both text ads and PLAs. Then focus on incremental gains: ensure your PLAs are showing on mobile devices and increase bids when a consumer is in or near your store, or even while they’re browsing nearby competitors’ offerings. Capitalize on recent improvements in mobile PLAs to increase mobile traffic, and point people to your physical stores with local availability for Product Listing Ads. For more tips, watch our videos on Preparing Your Data Feeds for the Holidays, PLA Optimization Essentials and Advanced PLA Optimization Tactics. In a couple of days, it will be November and the holiday rush will be in full swing. With six fewer days between Thanksgiving and Christmas compared to last year, retailers must make the condensed holiday shopping period count. Here are our top tips for using Product Listing Ads (PLAs) to your advantage this holiday.
. Ad extensions typically improve clickthrough rate and overall campaign performance because they make ads more useful. 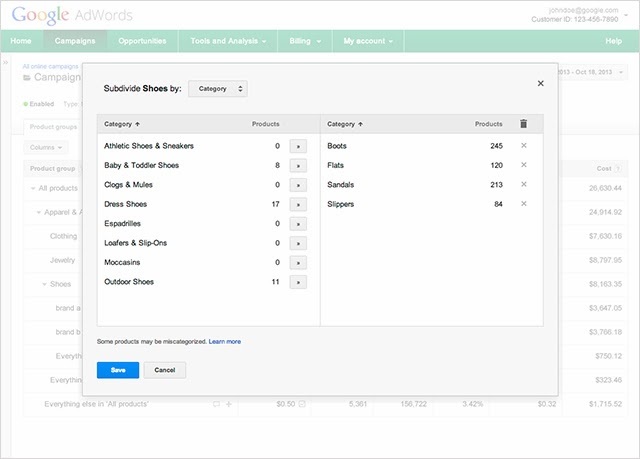 Shopping campaigns allow you to browse your product inventory directly in AdWords and create product groups for the items you want to bid on. For example, if you’re a fashion retailer, you’ll see what types of shoes are in your data feed and how many boots you can promote. You use the product attributes derived from your data feed such as Google product category, product type, brand, condition, item id and custom labels to organize your inventory into product groups. Custom labels are a new, structured way to tag your products in your data feed with attributes that matter to you, such as ‘margin’ to separate your high- and low-margin products. To see all the items you can bid on, the Products tab will show you a full list of your approved products and their product attributes. Regardless of how you choose to structure your product groups, Shopping campaigns offer the unprecedented ability to view your performance data by product or product attribute. Since performance metrics are associated with the item and not the product group, you can filter and segment data by your product attributes. This includes Google product category, product type, brand, condition, item id and custom labels. For example, you’ll see which Apparel & Accessories categories drive the most clicks, without having to break out your clothing category into a separate product group. To help you optimize and scale your PLAs, Shopping campaigns provide insights into your competitive landscape. In the Product Groups tab, you can add benchmark columns to see the estimated average CTR and Max CPC for other advertisers with similar products. The competitive performance data you see is aggregated and averaged, so all performance data is anonymous. Coming soon, you’ll have impression share columns to help you understand the opportunity lost due to insufficient bids and budgets, and a bid simulator will help you estimate the amount of impressions you’ll receive as you adjust your bids. Shopping campaigns are currently available to a limited number of advertisers. It will be rolling out gradually in the US, with full global availability by early next year. API support will come in 2014 as well. You can learn more about Shopping campaigns at some upcoming events. Join us at our Learn With Google webinar for Shopping campaigns on November 20, 2013, and find us at Search Engine Strategies in Chicago on November 6, 2013. We've built Shopping campaigns with retailers in mind, and if you'd like to be an early adopter to share your feedback, you can express your interest here. We'd love to hear from you! To make it easier for you to connect with these consumers and promote your products on Google, we’re introducing Shopping campaigns, a new campaign type for PLAs. Shopping campaigns streamline how you manage and bid on your products, report on your performance, and find opportunities to grow your traffic from Google. or ‘location of interest’ setting will be able to show ads to potential customers by taking into account both the location that people are searching for, as well as the location they are searching from -- even when they are international searches. For example, let’s say you own a hotel, and you are currently targeting Paris with the keyword “Paris hotels.” Previously, only people searching on Google.fr or Google.com from France could see your ad. Starting the week of November 11, your ads will be eligible to show to people searching for “Paris hotels” from anywhere in the world -- for example, someone who lives in New York City who is booking a vacation in Paris. These improvements help you share your message with more customers who have expressed interest in your business and deliver a better set of results to people who are searching with locations in their intent. Most advertisers will find that this change improves the reach of their ads with no action needed. In fact, this is currently how targeting works within countries. This update just ensures that searches across countries work in the same way. Your ads will continue to show to your target audience based on the location targeting options that you have set. In some cases you may see a change in impression volume since your ads can now show to people who are searching for your business from places where your ads weren’t previously showing. These changes offer broader coverage for your ads while keeping your existing location options intact. If you prefer to narrow your location settings, you can still do so using advanced location options by selecting the “People in my targeted location” radio button. You can also exclude geographic locations to prevent your ads from showing in selected regions. People are searching in ways that transcend geographical boundaries, and we want to ensure that AdWords reflects this global reality. These location targeting updates make it easier for potential customers to find your business, and easier for you to connect with them – wherever they may be looking. The world is getting smaller. Today, people use search to shop for products and services from around the corner or across the world. This means that every business can now be a global business. To help you connect with your customers - wherever they’re located - we’re improving the way location targeting works in AdWords. Starting the week of November 11, 2013, advertisers using either the default or ‘location of interest’ setting will be able to show ads to potential customers by taking into account both the location that people are searching for, as well as the location they are searching from -- even when they are international searches. For example, let’s say you own a hotel, and you are currently targeting Paris with the keyword “Paris hotels.” Previously, only people searching on Google.fr or Google.com from France could see your ad. Starting the week of November 11, your ads will be eligible to show to people searching for “Paris hotels” from anywhere in the world -- for example, someone who lives in New York City who is booking a vacation in Paris. We’re excited to share our fall series of Learn with Google webinars. These web events will demonstrate how to use digital marketing to build brand awareness and give you the tools you need to drive sales. This season we’re focusing on Search and Display, two fundamental building blocks for digital marketing. We will be introducing new tools, as well as providing tips for existing ones. Every webinar is led by Google product experts and includes time for live Q&A. Sign up to start becoming a smarter digital marketer today. shows that online sales during Black Friday increased by 26% last year. * By optimizing your Product Listing Ads you can not only increase your overall sales but also aid you in preparing early for a head start on this year’s holiday rush. To help you get ready, we want to share a few holiday optimization tips and insights from Channel Intelligence and also invite you to a webinar on October 15th at 11am PT. Channel Intelligence is a feed management service acquired by Google in February. Channel Intelligence works with many merchants to deliver high quality product feeds across all major shopping engine services, including Product Listing Ads. Channel Intelligence manages feeds, optimizes bidding and provides data quality monitoring for clients. These services can help with increasing Return on Ad Spend while improving the performance of individual products on shopping engines. Make sure your data quality is accurate. A good data feed is important. Confirm that all of your products are correctly submitted to Google and approved. Review policies for such things as non-family safe items. Get ready for traffic across devices. Shoppers will be on-the-go throughout the holidays. Reach where shoppers are by opting into mobile bidding as part of your overall holiday strategy. Prepare for Cyber Monday. Shoppers are going to be looking for the best deals on products. If you are planning to have holiday promotions for your products, there’s a separate attribute for promotional text. More details can be found in the feed specifications at the Merchant Center Help Center. The team at Channel Intelligence will share knowledge and experience with Product Listing Ads to help you prepare for the holidays. The team is giving insight on how merchants can get more from their product campaigns this season. Topics will cover where multichannel retail is heading, how you can improve your ad content, and how to apply best practices to your campaigns. If you are interested in the webinar, register here. To learn more about Channel Intelligence services, visit www.channelintelligence.com. If you are new to Product Listing Ads and would like step-by-step instructions on how you can get started, check out our Get Started Guide. With the holidays right around the corner and shoppers already beginning their holiday shopping research online, advertisers are getting poised to reach those customers. Research from Think With Google shows that online sales during Black Friday increased by 26% last year. * By optimizing your Product Listing Ads you can not only increase your overall sales but also aid you in preparing early for a head start on this year’s holiday rush. To help you get ready, we want to share a few holiday optimization tips and insights from Channel Intelligence and also invite you to a webinar on October 15th at 11am PT. With Google Shopping, people can easily research products, compare items, and connect with merchants online to make their purchase. We've been going global to bring a quality online shopping experience to users around the world. But sometimes the most helpful information about a product is whether you can find it at a local store nearby. 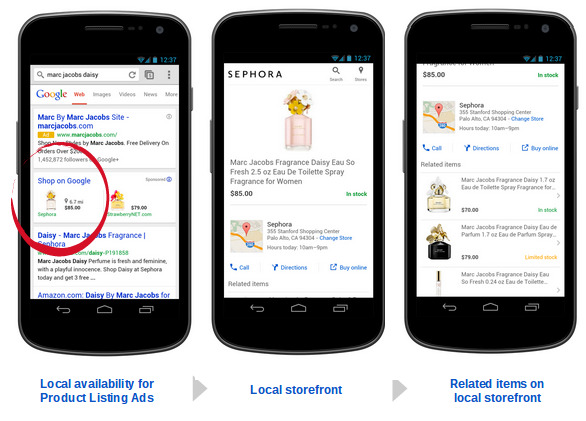 Recently, we began rolling out two new local features for Google Shopping. The first is local availability for Product Listing Ads on desktop and smartphones. When someone searches for a product on Google, she may see a Product Listing Ad for a local store. When she clicks on the ad, she’ll arrive at a local storefront where she can browse a large selection of the store’s inventory before she visits in person. For example, someone searching for a new fragrance may see an ad letting her know it’s available at a nearby store. After clicking the ad, she’ll see product and availability information for that fragrance, along with similar items in stock at the store. She can search other available products, find store hours, and get directions. If she still needs more information, she can call the store or visit the website directly from the local storefront. Below are examples of how these features appear on mobile and desktop devices. 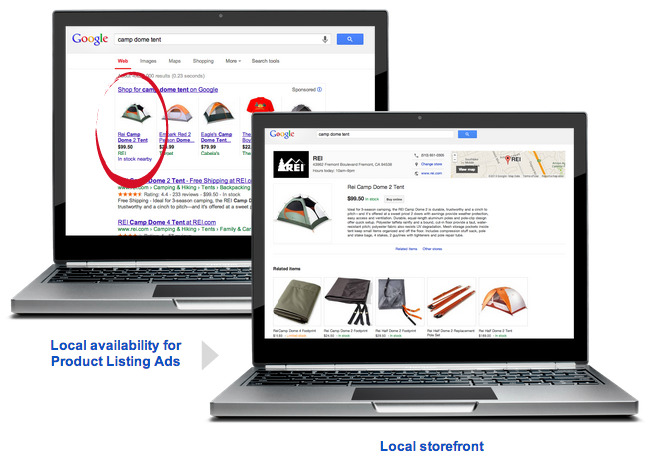 Both local availability for Product Listing Ads and the local storefront are based on a local product feed managed through Google Merchant Center, which allows retailers to provide users with up-to-date, item-level price and availability information for each physical store. Participating retailers pay for clicks on the Product Listing Ad to the local storefront on a cost-per-click (CPC) basis. All clicks and interactions on the local storefront are free. Retailers can also see separate local click performance. These local features help retailers leverage the scale of Google Shopping to market items sold in their physical stores. They’re currently available to a limited set of US retailers, and we look forward to making them more widely available in the coming months. Please fill out this interest form if you are a US merchant and would like to participate in the future. 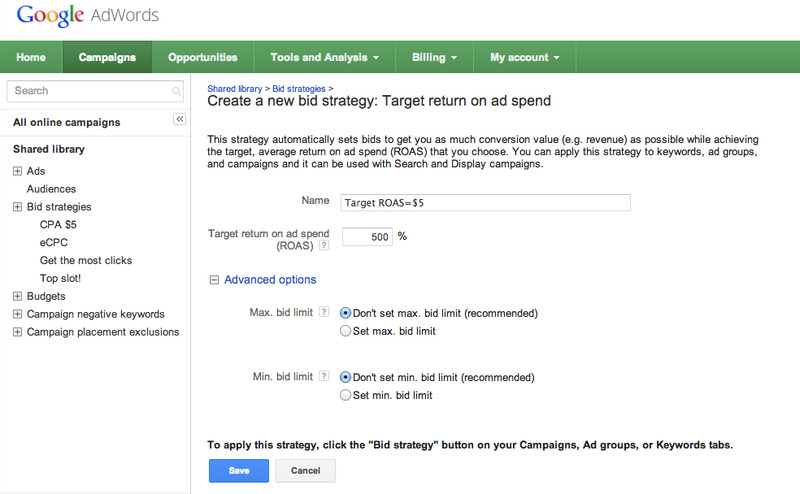 as part of our ongoing initiative to improve real-time bid automation in AdWords. Today, we are announcing target return on ad spend (ROAS), a new bid strategy, as part of this broader initiative to provide greater flexibility and control over performance targets and better overall return from your ad spend. You should see the target ROAS bid strategy rolling out to your account over the coming weeks. To demonstrate the power of target ROAS, we’ll walk you through an example. Let’s say you’re an advertiser whose conversion values vary from product to product. Ideally, you’d love to bid higher on keywords that lead to larger orders, and lower for keywords that lead to smaller ones, however, this would be time consuming and complex to do manually. Set up conversion values in Conversion Tracking so that AdWords understands the value of orders placed on your site. Choose the ROAS percentage that matches your business goals. You can learn about setting an appropriate target ROAS here. Enter your target ROAS into your newly created flexible bid strategy. Once you’ve applied this bid strategy to keywords in your account, AdWords will predict the likelihood that a click will lead to a high-value sale. Based on this likelihood, the system then sets unique bids for each click, taking into account your specified ROAS target. Since this happens automatically and in real time every time your ad is shown, your bids are optimized toward your goals without having to enter a single manual bid. Once you begin using target ROAS, you’ll see a rough average of the Max CPC bids Google is setting in Search Network auctions in your Max CPC column. This helps illustrate the auctions’ bids for keywords that are using the bid strategy. 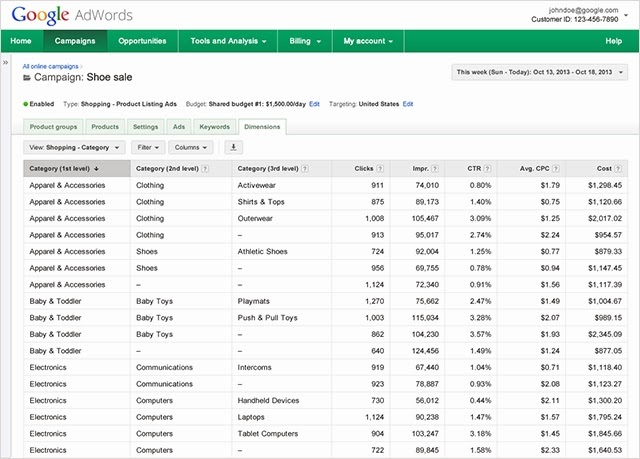 To learn more about getting started with target ROAS, visit the AdWords Help Center. You can also tune into the Target ROAS webinar on October 22nd for a live walkthrough on setting up conversion values and using this new strategy. You can sign up for the webinar here. In May, we introduced flexible bid strategies as part of our ongoing initiative to improve real-time bid automation in AdWords. Today, we are announcing target return on ad spend (ROAS), a new bid strategy, as part of this broader initiative to provide greater flexibility and control over performance targets and better overall return from your ad spend. You should see the target ROAS bid strategy rolling out to your account over the coming weeks. 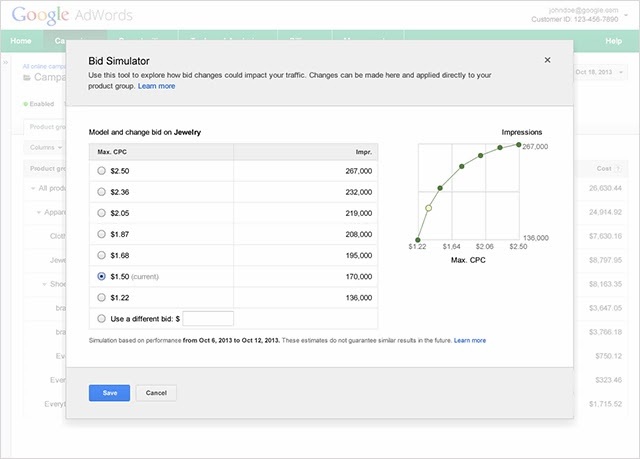 Today, we are introducing Estimated Total Conversions for search ads on Google.com. 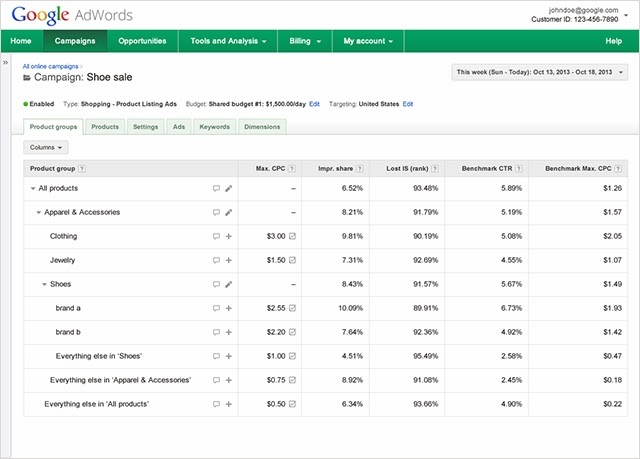 This is an exciting first step to give marketers more insight into how AdWords drives conversions for your business by showing you both the conversions you see today, like online sales, as well as an estimate of conversions that take multiple devices to complete. Over time, we’ll be adding other conversion types like phone calls and store visits as well as conversions from ads on our search and display network. Estimated Total Conversions will provide you with a holistic view of all of the conversions driven by your Google search advertising that can be used to make important decisions like how much to bid and how to assign budget across your various marketing channels. For the last few years, many sophisticated advertisers have been using their own analysis to get to these insights. Today, we are beginning to bring this level of insight and measurement to all advertisers. Estimated cross-device conversions is the first new conversion type to launch as part of Estimated Total Conversions. Cross-device conversions start as a click on a search ad on Google.com on one device and end as a conversion on another device (or in a different web browser on the same device). For example, say someone shops for “blue jeans” on her mobile phone while waiting for the morning train. She clicks on a mobile ad for ABC Blue Jeans. When she gets to her office, she goes directly to the ABC website to make a purchase. This is an example of a cross-device conversion. We calculate cross-device conversions using a sample of data from users who signed into multiple devices. Learn more about how this works. Estimated cross-device conversions will begin rolling out globally to all AdWords advertisers starting today and continuing over the next few weeks. To see these new statistics, you’ll need AdWords conversion tracking and a sufficient volume of conversions on which to base a reliable estimate. In the last few months, we’ve analyzed data across thousands of AdWords advertisers to learn more about cross-device conversion patterns. When advertisers in the travel industry use AdWords estimated cross-device conversions, they are able to measure 8% more conversions, on average, than they did before. In addition, they can now measure 33% more conversions that originated on a mobile phone and later converted on different device. This helps them attribute all those sales -- from customers who searched for flights and hotels on their mobile phones and then made a purchase from another device -- to the right ad. Similarly, other verticals, like entertainment and retail are also seeing positive results. Businesses in these industries are now able to measure 12% and 7% more conversions, respectively, than they could before using Estimated Total Conversions. More results from other verticals can be seen below. We are committed to helping you gain insight into the new conversion types that are part of a constantly connected, multi-screen world so that you can make the best advertising decisions possible. In addition to cross-device conversions, both phone calls and store visits will be included as part of Estimated Total Conversions in the coming months. These are important conversions to consider — people make more than 40M calls to businesses each month directly from Google ads and are often looking for physical store locations when they search on Google, particularly on the go. We look forward to your feedback on estimated cross-device conversions and are working hard to add new features. Over the coming weeks we’ll dive into the new features with tips and best practices on the Inside AdWords blog and on the new Think Insights page for conversions. We hope you will join us.